Lincoln Soldati is in a tough battle for NH's 1st Congressional District. Lincoln Soldati, the former Strafford County attorney and military veteran, has been vocal on three major issues: justice for sexual abuse and child abuse victims, immigration justice and the impeachment of President Donald Trump. On Wednesday morning, Soldati, a Democrat, began "Walking the Walk" with other immigration advocates. 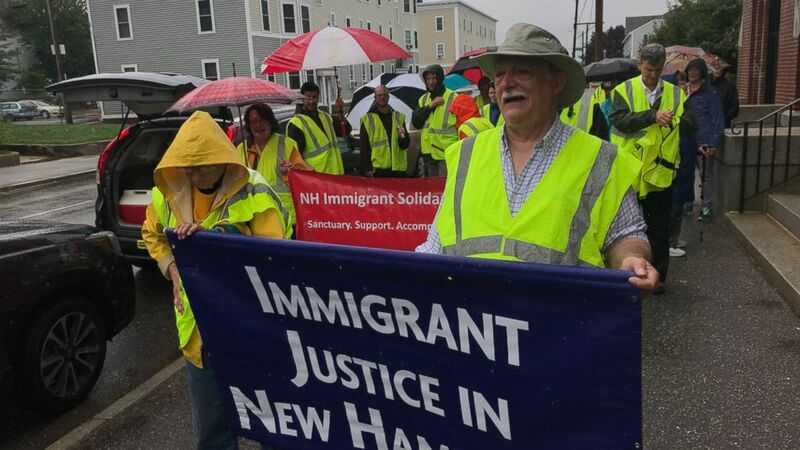 The 40-mile journey from the U.S. Immigration and Customs Enforcement (ICE) office in Manchester, New Hampshire, to the ICE detention facility in Dover will take place from Wednesday to Saturday. Participants will walk 10 miles a day, according to the event site. (Emmett Soldati ) Democratic candidate Lincoln Soldati is walking 40 miles for immigration justice. Soldati is the only candidate in New Hampshire’s 1st Congressional District to do the walk, and, for him, this walk is personal. "I am the grandson of immigrants," he wrote in a release. "And unless you’re Native or African American, you are here because of immigrants." Soldati also said in his press release regarding the event that his grandson is an immigrant. "100 years after my grandparents settled in Somersworth, a West African teenager, fleeing death and persecution, sought asylum in America, seeking refuge and safety," he said. "Instead, he found ICE agents who altered his birth certificate to make him appear over 18 so they could detain him. While incarcerated, he taught himself English, and never stopped believing there was a place for him in America. He was right, as he too found a home in Somersworth, it was our son’s home. I’m proud he calls me grandpa and to witness the American dream live on in a new generation." While a poll from Saint Anselm College’s New Hampshire Institute of Politics has him ranked third and Chris Pappas and Maura Sullivan significantly ahead, the campaign noted to ABC News that Soldati is leading progressives. "He is in first place amongst progressive candidates calling for Medicare4All, Abolishment of ICE, impeachment of Donald Trump, and a refusal to accept PAC or Lobbyists funding -- all things the two ahead of him do not support," Emmett Soldati, son of the Democratic candidate, told ABC News. 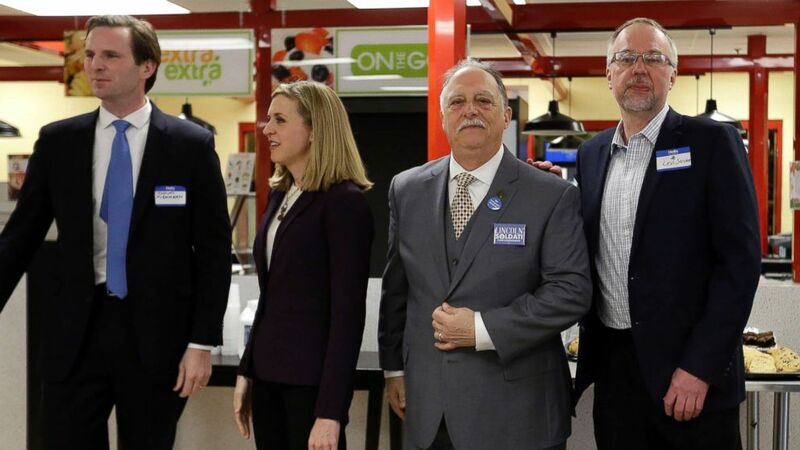 (Elise Amendola/AP) Candidates for Congress, from left, Deaglan McEachern, Maura Sullivan, Lincoln Soldati and Levi Sanders gather for a group photo before a candidates' forum, April 5, 2018, in Rochester, N.H.
From the start of his campaign, Lincoln Soldati has been adamant in leading the proceeding to impeach Trump if elected. He previously told ABC News it is why he entered the race in the first place. His son was quick to point out his father is the oldest candidate in the dense and competitive race, and he's there to make sure the country does not remain in danger. "His conduct as I read the constitution, as I watch various things he’s done... it seems very clear he has abandoned his role as commander-in-chief," he told ABC News earlier this year. In May, residents and visitors driving through Somersworth, New Hampshire, saw a combination of politics and business -- a billboard containing the phrase: "Did somebody say impeachment?" However, the "peach" in "impeachment" has the peach emoji in place of the word. The billboard was created by his son Emmett Soldati, who is a small business owner. Decades before the #MeToo movement, Soldati advocated for victims of child abuse and sexual assault during his time as Strafford County attorney. He created a protocol "that led to increased reporting by survivors of sexual assault," according to a release. It set a standard for the state of New Hampshire, putting the state "at the forefront of victims rights in America," the release continued.